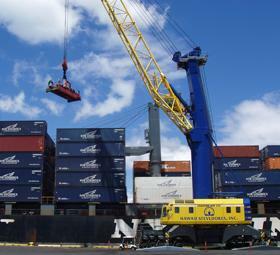 Hawaii Stevedores provides ship and barge lines with personnel and equipment for the handling of marine cargo. Our Guide to Safety "Safety Is A Way Of Life "
Safety is a way of life and part of everything we do, both on and off the job. Everyone has the responsibility to ensure a safe work environment. We want our associates to go home the same way they came to work. We want to "convince," not "confront" our associates. We will live by our human and moral commitment to our associates and customers to reduce pain and suffering in the workplace. We will strive to have the lowest possible personal injury and accident rates. We are committed to provide stevedoring services in a manner that will ensure the maximum safety of our associates, the safeguarding of our customers cargo, and the safety of the communities we serve. Most injuries and accidents are preventable and we will strive to prevent them. Each individual is responsible and accountable for their own safety and the safety of others. We must always lead by example. A strong, visible, felt leadership commitment to safety is imperative. Teamwork across departments and involvement by all is critical to safety success. To reduce injuries and accidents, we must recognize professionalism in safety and address unsafe work habits. No job is so important, no service so urgent that we cannot take time to perform all work safely.